Portable data security has stepped up a notch following one manufacturer’s decision to pair a USB Flash drive with facial recognition technology. 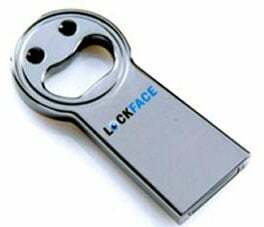 The first time you plug the Lockface USB driveinto your PC, you will be asked to "register" your face, so that in future the device can authenticate your pearly white grin and baby blue eyes with ease. All the software required to register your face is contained on the 4GB drive itself, but its facial recognition feature only works with PCs connected to a webcam. Plug the keyhole-shaped drive into a friend’s camless machine and you will instead be asked for a password before being granted access to Lockface’s data files, according to a report by the Nikkei. Should a would-be data thief fail miserably at passing their face off as yours or at guessing your password, they could always break into your beer supply using Lockface’s handy integrated bottle opener.